Combine all marinade ingredients in a shallow, glass baking dish or gallon size sealable plastic bag; remove 1 cup of marinade and place in a separate baking dish or bag. Add pork tenderloin to the first conatiner of marinade and the vegetables to the second container. Refrigerate, covered 4 to 6 hours. Drain marinade from pork and vegetables into a small saucepan. Bring to a boil over high heat and boil for 20 seconds. 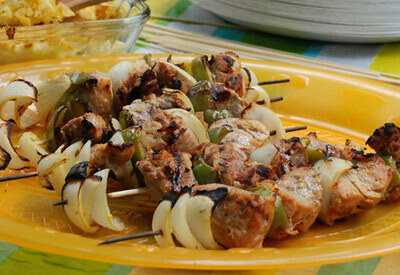 Thread pork, peppers and onion onto skewers so pieces are not touching allowing heat to circulate and cook evenly. Place skewers on preheated grill over direct medium heat for 10 to 12 minutes, turning and basting with the reserved marinade once. Serve immediately.